While this blog focuses on whisky, it would be a shame to ignore the wonderful variety of spirits available. I believe that it is important to try different spirits (especially armagnac, cognac and rum)to develop your palate and appreciation for the distinctive attributes of whisky. Comparing spirits can be just as rewarding as comparing whiskies! 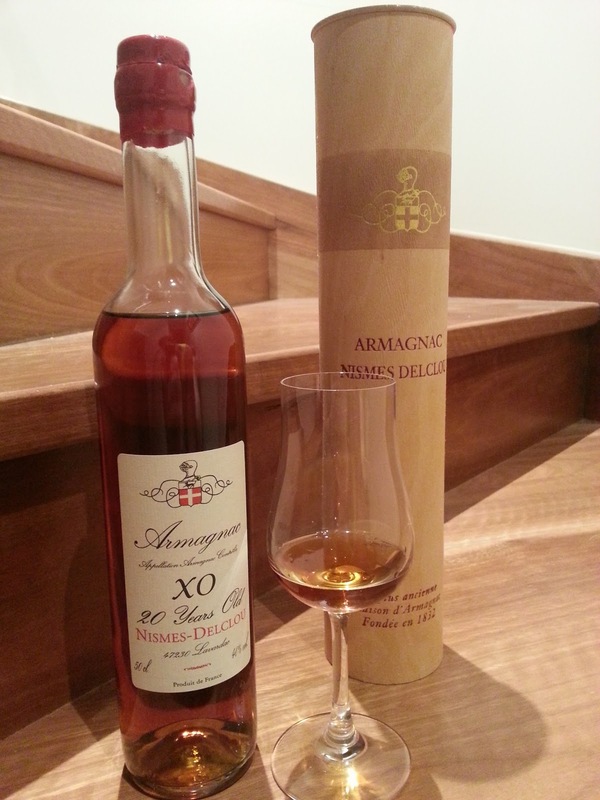 I have the pleasure of writing a review of a 20 Year Old Nismes-Delclou Armagnac XO, which is essentially a brandy that is produced in southern France within the Armagnac region in Gascony. Armagnac is commonly distilled only once unlike Cognac which is distilled twice, and produced from specific authorized grapes. Like whisky, the spirit is then aged in oak barrels. Cognac and Armagnac branded VSOP have been aged for five years and the XO have been aged for six. As you can tell, the Armagnac and cognac industry is heavily regulated in France. As expected sweetness permeates the nose like sniffing moscato and port, though some bitterness and oak moderate this sweetness as tangy zest adds some buzz. Let this brandy rest in a glass before enjoying it, as this will allow it to release all its wonderful beauty. The age of this Armagnac is evident, with a lovely oily texture that hugs the glass and a rich deep amber colour with tinges of brown. The nose on this Armagnac is perfect. After a little while orange peel and orange cake set in as a dominant scent, layered with honey and syrup. All the while that wonderful age and oak keeps everything well balanced. I better take a sip of I’ll be here all night! Majestic, with sheer elegance this Armagnac delights my tongue with the smoothest of entries as it politely unleashes gentle flavours that develop and get stronger until an explosion of oak and citrus engulf my entire mouth. This is beautiful Armagnac. Absolutely beautiful! That sweetness, almost port sweetness, is not overpowering. It is not overly sweet despite its nose, and instead has a magnificent balance. There is something quite spectacular about an aged brandy, as the oak interacts with the fermented grape over time. It offers a wonderful buzz, like sherbet in the mouth as it tingles and fizzes. Then with the fizz of champagne it begins to come to an end. Wondrously long, this Armagnac delivers a brilliant surge of dry sweetness and supple age in almost perfect harmony. So forget the croissants and art, you’ve not experienced French culture until you try a good Armagnac! The only negative feature of this Armagnac, for me, is that it was very slightly unbalanced towards the sweet side. Bonsoir! Now, go and make love!